"A series of tubes" is one of the most famous explanations of what makes the internet work, but it's also what many Europeans use to heat their homes. That's made room-by-room heating automation difficult -- until now. Heating systems in Europe typically circulate hot water from a boiler to radiators around the home, with the pump and boiler controlled by a central thermostat. Programmable timers can boost the temperature on winter evenings or lower it at night. Generally, though, such control is an all-or-nothing, whole-home affair, making it impossible to heat the living room only in the evening but warm the bathroom for a morning shower. Smart controllers like Nest and its European competitors Tado and Netatmo can't change that, as the series of tubes in most homes doesn't allow for independent control of different heating zones. That's why the remote-controlled thermostatic radiator valves (TRVs) on show at IFA this year are such a big deal: They allow a central controller to independently set the temperature for each room and ensure that the boiler and pump run only when needed, saving energy and money. Manufacturers have released a trickle of smart TRVs in recent years, but in 2016 it's as if they've suddenly opened the tap. Tado showed its first smart TRV at IFA in 2015 but sold only enough to equip a few hundred homes. This year it's showing a new version, compatible with Apple's HomeKit and priced at €79 (US$89), or €199 for a starter pack containing two valves and an internet bridge. The Smart Radiator Thermostat doesn't need the bridge to work, but it can do a lot more if you have one, said Tado CEO Christian Deilmann. For instance, you can program it from a smartphone or have it check the weather forecast, turning off earlier on warmer days to avoid overheating. 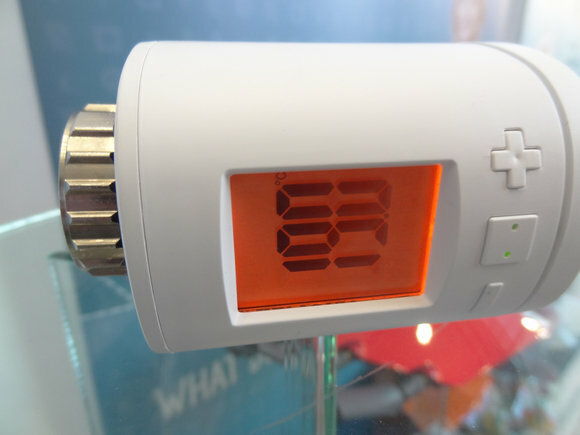 The Tado Smart Radiator Thermostat has a white LED display to show the temperature. It was released at IFA Berlin in September 2016. It's also possible to change the set temperature by twisting the valve's outer casing, overriding any programming. The new temperature is displayed by white LEDs visible through the casing, much like on its wall thermostat. Two AA batteries will power it for up to two years if you don't fiddle with it too much, Deilmann said. Tado's heating control products talk to one another using the 6LoWPAN radio protocol, which has the same IEEE 802.15.4 underpinnings as Thread and ZigBee. Netatmo is making its first foray into the field with its Smart Radiator Valve. It has an e-paper display, echoing the design of the company's wall thermostat. As with the Tado device, twisting the cap sets the temperature. More sophisticated control requires a Netatmo Smart Thermostat or the Netatmo mobile app -- which in turn requires either the thermostat or a Wi-Fi gateway to connect to the valve. It's also possible to set the radiator temperature via Apple's Siri, and in iOS 10, you can do it from Apple's Home app, said Netatmo program manager Romain Paoli. The Netatmo valve will go on sale by year-end priced €69.99, or €179.99 for a starter pack containing two valves and a Wi-Fi gateway. 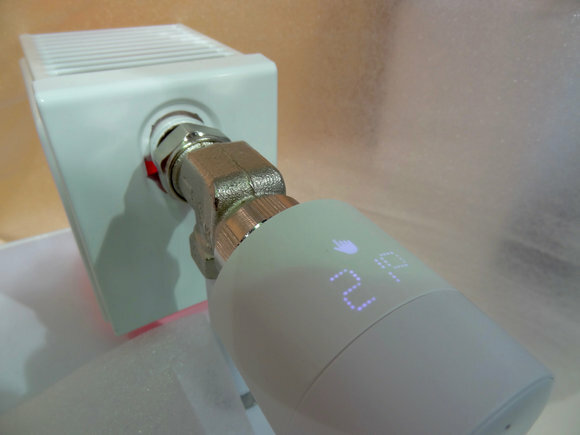 Home router company D-Link is clearly hoping to connect one series of tubes with another with its mydlink Home Thermostatic Radiator Valve (DCH-Z410). It hasn't set a price for the device yet, but product marketing manager Markus Schütz said comparable devices range from €60 to €80. It should go on sale by year-end, he said. D-Link's DCH-Z410 smart radiator valve connects to the company's mydlink Home hub. It was shown at IFA Berlin in September 2016. D-Link has chosen Z-Wave as the radio protocol for this and other mydlink Home devices, all of which can be controlled through its €89 Connected Home Hub using a single app. AVM picked the DECT Ultra Low Energy (ULE) radio protocol for its remotely controllable valve, the FritzDECT 300. There aren't too many home automation gateways that use DECT ULE yet -- apart from the company's own range of FritzBox DSL routers, which are popular in Germany. 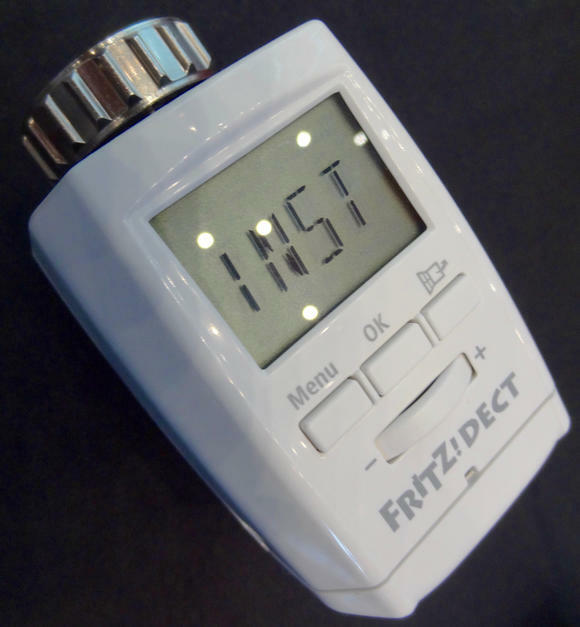 The FritzDECT 300 smart radiator thermostat connects to AVM's home routers using the DECT Ultra Low Energy protocol. It was shown at IFA Berlin in September 2016. The interface on those routers will allow the creation of heating scenarios based on outside temperatures and the times of sunrise and sunset, said AVM's Janis Engel. The FritzDECT 300 will cost about €59 when it goes on sale in October, he said. Programming older remotely controllable TRVs required a lot of work to integrate them with home automation gateways, and apps from the various manufacturers were often lacking features and under-supported. The arrival of Siri integration and Apple’s forthcoming new Home app, though, promises to simplify things for people who just want their home controls to work, without having to geek out on the settings. By next year’s IFA show, we can expect even more TRVs on the market. One company, Levarys, is already promising its home automation system Luna will have a controllable radiator valve by then. The series of tubes, it seems, can only grow.